Many people ask, "Can you freeze apples?" YES you can! ... and it's so easy to do! 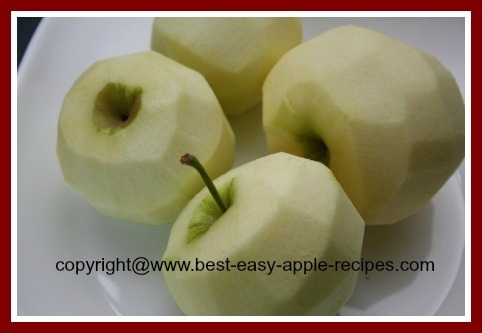 If you are looking for information about freezing apples you have come to the right place! Can you FREEZE APPLES? ... YES! You CAN Freeze Apples! Here (below) are simple directions how freeze apples with or without sugar/syrup. My favourite method is the dry pack method without sugar (scroll down for instructions). Although with proper storage of apples they retain their freshness for quite a long time, eventually they do begin to loose their texture, crispness and flavour. For this reason if apples need to be stored for a long period of time it is advisable to preserve them by one the following methods: freezing apples, drying (dehydrating apples), or canning apples. Which apple varieties are best for freezing? The following types of apples have been suggested as apples best suited for freezing: Cortland, Crispin, Golden Delicious, Empire, Ida Red, Jonagold, Northern Spy, Red Rome, Wealthy, Fuji, Gala, Gravenstein, Jonathan, Rome Beauty and Mutsu. I am sure there are many more varieties of apples that freeze well in addition to those listed above. Generally try to chose a type of apple that is sweet, not tart. See Also: What Apples are Best for What? How long can apples be stored in the freezer? At 0 ° F or below, apples can be frozen for up to one year. How many apples do I need? Here is a link to apple conversion and measurement amounts. ★ First, before you begin to freeze apples, choose which method you will use to treat the apples to help prevent them from browning when cut and peeled. Unlike fruit such as raspberries, blueberries and strawberries, enzymes in light coloured fruit such as apples, peaches and pears can cause oxidative browning when the fruit is peeled or cut, therefore when preparing the apples for freezing it is necessary to "treat" the fruit. To help prevent browning apples can be treated with lemon juice or ascorbic acid (Vitamin C). Products such as "Fruit Fresh" can be purchased from most grocery stores, or online through Amazon.com (click product pictured below for details). These products are essentially ascorbic acid. Ascorbic acid dissolves easily in cold liquids and it will not change the flavour of the fruit treated with it. Which method of colour preservation you will use is your choice. 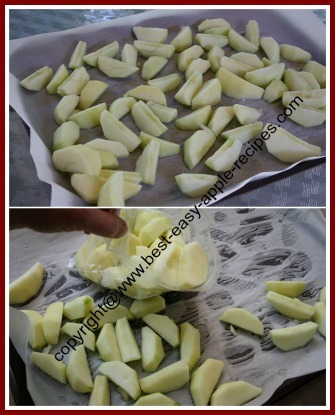 I have explained each method in the process of how to freeze apples (below). I like to use the Fresh Fruit Protector product below, available for purchase online at *Amazon.com. Click on the image for more detailed product information and product reviews. 1. Syrup Pack - Freezing apples in a sugar/water liquid. To make a syrup pack combine the following amounts of water and granulated sugar and heat gently until the sugar is completely dissolved and the liquid is clear. Allow mixture to cool completely before pouring over the prepared apple slices. 2. Sugar Pack - Freezing apples with granulated sugar. Add 1/4 cup sugar to 4 cups fruit. 3. Dry Pack - Freezing apples without sugar. Adding sugar to the apples is not necessary to safely preserve the fruit. Whether or not you chose to add sugar or syrup to the apples depends on your own choice, and what you plan to use the apples for at a later time. Fruit packed in syrup is generally best used for uncooked desserts or fruit salads, while those packed in sugar and the dry pack (unsweetened) method are best used for cooking and baking pies, crumbles, etc. The dry pack method can also be used for making apple smoothies! Prepare the syrup if you are using that method. If you are processing a large quantity of apples you may wish to invest in a mechanical apple peeler. They work very quick and efficiently. The apple peeler pictured below, available for online purchase from *Amazon.com is highly recommended apple peeler with a handy suction cup base (click on the image below for more product information and customer reviews. If you do not have one, a knife will work just fine to peel the apples. Cut away any obvious brown marks on the fruit. 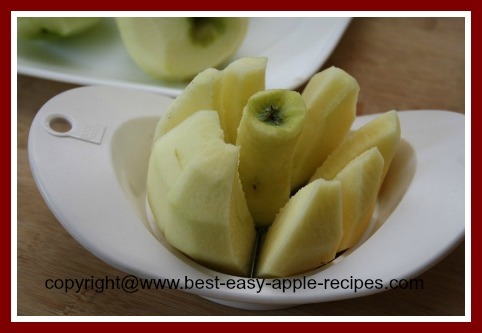 An apple corer and slicer /divider will work the quickest. If you do not have one of these, I highly recommend you purchase one. They are great for using when packing the kids' lunches too. Simply cut and core a fresh apple, treat it with lemon juice or ascorbic acid, place it in a sealable bag, and pop it into the lunch bag! This gadget is inexpensive and well worth the little it costs. Click on the image at right for product information, available for online purchase at *Amazon. A - If you are using "Fruit Fresh" or another purchased product, follow the directions on the container for the mixture ratio between water and the ascorbic acid. The "Fruit Fresh" instructions are to dissolve 1/2 tsp. of powder into 3 tbsp. water. B - If you are using lemon juice (bottled lemon juice is fine), mix 1 tbsp. lemon juice into 4 cups water in a large bowl. Use Fruit Fresh Powder or Make your Own Mixture Using Lemon Juice to Keep the Apples Fresh and Help to Prevent Browning! Step 5 - Mix the apples with the sugar or syrup, pack and freeze. 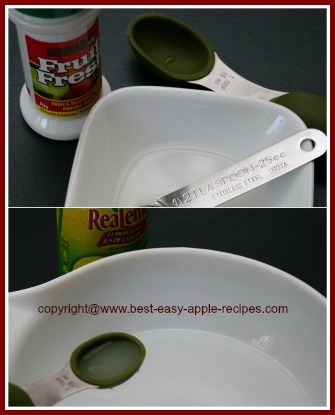 For the Syrup Pack Method, add the prepared syrup to the apples in a bowl and mix well. Pack into containers or sealable bags, or add syrup to the containers, add the sliced apples and then top with more syrup if needed. Ensure the apples are covered with syrup, then label and freeze. NOTE - It is also possible, if desired, to add the ascorbic acid directly into the cold syrup just prior to using the syrup, and slicing the apples directly into the syrup containing the ascorbic acid treatment. For the Sugar Pack Method, mix the apple slices with the sugar using a bowl or toss together in a sealable bag. 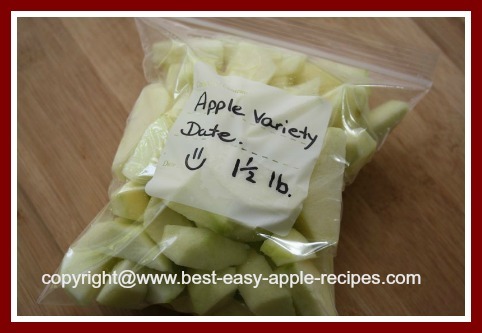 Pack apples into containers or sealable bags, label, and freeze. For the Dry Pack (Unsweetened) Method simply freeze the treated apple slices in containers or sealable bags. If desired, to avoid the apple slices from "sticking" together during the freezing process, place the treated apple slices in a single layer on parchment lined trays or cookie baking sheets, and freeze for about 2 - 4 hours or until frozen, then immediately pack the frozen slices into sealable bags or containers (see images below). 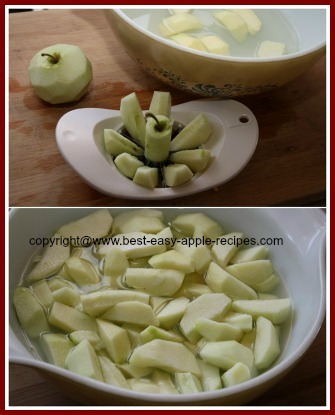 Freezing Peeled Apples With OR Without Sugar is Quick and Easy! Before freezing apples, I like to weigh them so I have an idea of how much frozen apples I need to remove from the freezer to use in a recipe. Using the apple conversion/measurements information page (link below) I can remove the right amount of frozen apple slices from the freezer without needing to re-measure. I received a kitchen weight scale as a wedding gift many years ago. At first I didn't know if it was something I would really use much, however, as it turned out, I use it a lot! Now I can't do without the convenience of a weigh scale on my kitchen counter. Kitchen weigh scales are relatively inexpensive. They are available at many large department or "big box" stores, or you can purchase one online from Amazon.com (click on image at right for product details).